The Perrin Technique – Are Poor Posture and Poor Lymph Flow the Cause of Chronic Fatigue Syndrome? After years of working as an osteopath, Dr. Raymond Perrin discovered a link between posture and chronic fatigue. He believes the fundamental cause of Chronic Fatigue Syndrome (CFS) is stagnant lymph (and toxin) drainage from the brain as a result of a combination of poor posture and stress. As a result, he has developed the Perrin Technique which he uses to treat patients with Chronic Fatigue Syndrome through stimulating lymph drainage and toxin clearance. So what is the Perrin Technique, what research is it based on, and how does it work? I have been wanting to have Dr. Raymond Perrin on the podcast for a long time. He is a pioneer in his field and has spent more than 20 years researching and treating people with chronic fatigue, and I believe that his work is an important contribution to this field. Ari Whitten: Hey there, welcome back to the Energy Blueprint Podcast. This is Ari Whitten and today I have a very, very special guest. Someone I’ve wanted to have on the podcast for a long time. He is a pioneer in the field of chronic fatigue syndrome and he’s been doing this for over 20 years. His name is Dr. Raymond Perrin and he is a doctor of osteopathy as well as a Ph.D., one of the very few Ph.D.’s in the field of chronic fatigue syndrome specifically. He’s also a researcher and he’s been doing research and treating people in this area for over 20 years and really with some pioneering work and some pioneering theories in this field. So welcome Dr. Perrin, it’s such a pleasure to have you on. Dr. Raymond Perrin Ph.D.: Thank you very much, Ari. A pleasure to be on. Ari Whitten: Oh, I see. Dr. Raymond Perrin Ph.D.: I received that after four years study at the British School of Osteopathy, which is now the University College in London, and that’s after a four-year course. As an osteopath, osteopathic practitioners in America are more trained like MD’s. They learn. And lots of them don’t actually use hands-on treatment at all. Ari Whitten: Yeah, it’s become very phased out. Dr. Raymond Perrin Ph.D.: Yeah, and in England it totally goes back to the roots of osteopathy, using our hands to diagnose and treat patients with all sorts of problems and most people associate us … It’s very similar. In the States, you go to a chiropractor. It’s similar to what has happened in osteopathy in the UK. So it’s very unusual for people to when they see me and they say, “Well, what does he know about the body?” But osteopaths are trained for four years. But then afterward, I did eleven years post grad studying for my doctorate in the field of chronic fatigue syndrome. Dr. Raymond Perrin Ph.D.: [inaudible] young upward mobile who just need to get out and do a bit more exercises. Too much [inaudible] office. And this was the people that needed just to do something else and that’s what they called it: yuppie flu. And unfortunately, I mean, I see patients from the age of five. The youngest I’ve seen is five and the oldest was 85. You can’t really describe them as yuppies. [inaudible] moment I started working with this patient. And I treated him and … Are you okay there? Dr. Raymond Perrin Ph.D.: And the thing is that when I treated his postural problems and he told me we call it in England, ME. Myalgic encephalomyelitis. And he says, “I’ve got ME” and I said, “Well, it’s not much I can do for that, but I can treat your posture.” And after a short while, his symptoms after a few weeks, his symptoms started to ease off. Not just his postural problems but his chronic fatigue ME. And within a few months, he was symptom-free. Ari Whitten: Remarkable. Yeah, and it’s fascinating to hear that story of kind of the origin of the discovery. I didn’t know that but that’s very serendipitous that you kind of discovered it accidentally almost. So let’s get right into kind of the meat of your theory and talk about, in your opinion, what is basically the cause of chronic fatigue syndrome or myalgic encephalomyelitis? Dr. Raymond Perrin Ph.D.: And they look at what tests they can do and what their scan shows, but they don’t actually look at the person, feel the person. And I, as an osteopath, do. And this is what we do and I started looking for more and more signs that these patients all shared. And then I published a paper in ’93, showing that there’s possibly a biomechanical cause of the whole problem. Then I went further and we did studies at Salford University in the UK, where we actually … I put down my theories and then this was eventually put into the Ph.D. and basically, it’s this. ME, I believe, or CFS/ME however you want to call it, there’s different names and now in America, they call it SEID. The new name for it. Systemic exertion intolerance disease, which I’m not very keen on. I mean, there are certainly different names and that’s the problem with ME is, well … But basically, it’s a buildup of toxins, mostly inflammatory toxins in the spine and the brain, in the central nervous system. This causes an irritation of the brain but mainly in the autonomic nervous system. In the nervous system that controls the functions of the body, the automatic functions of the body, and one of the main areas is in the brain stem and around the hypothalamus. Which, the hypothalamus is one of the main controllers of most of what we do and what goes on in our body. And this buildup of toxins and it can be other things besides … I mean, the one thing I talk about in my thesis is cytokines which are pro-inflammatory toxins that come from infections or inflammation. And then you’ve got environmental pollutants and then you’ve got trauma that can lead to more buildup of different inflammatory toxins in the brain. And then one of the most important causes of neurotoxicity is stress. And all this builds up and what happens is, it should drain away through channel enter the lymphatic system. Now, this, when I said this going back 20 odd years ago, came up with this theory, it was completely against medical thought at the time. Completely. The lymphatic system is a system of drainage. It’s a secondary system and one of the things, it’s been known for 400 years since a wonderful Italian called Aselli discovered it. And since then, everybody has actually accepted one fact, and it’s been proved wrong. And the fact is that the brain and the spinal cord, the central nervous system does not have a need for lymphatic drainage and doesn’t have one. Why does it not need one in the first place? Because the lymph is there for the larger molecules. Dr. Raymond Perrin Ph.D.: Because they have a barrier. Dr. Raymond Perrin Ph.D.: The blood-brain barrier. And that stops, it’s got very tight junctions and only very small molecules like water … If you look at the measurement of a water molecule and it’s like 18 daltons large. Dalton is the measurement of a molecule and something really large can’t get in. Now, this is so wrong, on all counts, but nobody actually thought about it until recently. But how do I know it’s wrong is because we now know exactly how the hormonal system in the body works. The hormonal system is a system of chemicals, large protein molecules that don’t swim in the blood but go around the blood and they cause lots of things to happen. Their control is through the main center of the hormonal control is the hypothalamus. The hypothalamus measures hormones by a mechanism called biofeedback that sends messages to change the hormonal level. Let’s give an example: insulin. Insulin’s produced by the pancreas. This pancreas produces insulin to control sugar levels. We all know about insulin and men and women all have insulin. Insulin enters the brain and there are receptors on the hypothalamus that measure the insulin. Now when I first said this, I was giving a workshop in New York. An eminent doctor who was an osteopathic physician said, “Ray, we love your work but it’s absolute nonsense. Insulin entering the brain? Absolute … How can it?” Now, how big it is? Water molecule? 18 daltons, goes through the blood-brain barrier. Insulin’s 5,808 daltons large. There’s no way it can get through the blood-brain barrier. But it does. Insulin receptors in the brain, we know this far in the hypothalamus and that’s how the hypothalamus controls all hormones by biofeedback. We know this for sure. So how does it get through? ‘Cause we now know the blood-brain barrier has got lots of gaps. And it’s not such a good barrier after all. And therefore, besides hormones entering, and this is a very big clue to why women get ME much more than men. The hormones, there’s much more involvement with the hormones in the hypothalamus in women than men, and there are lots of fluctuations. But lots of toxins that enter the brain as well. And this is what the problem is. Once we know they’re definitely toxins and definitely large molecules entering the brain, how did it get out? It’s a one-way system, this system of going into the brain, it doesn’t go out that way. It’s got to have a lymphatic drainage and we don’t officially have one in the brain and spinal cord. Ari Whitten: If I can just interject one point for emphasis here ’cause I think it’s so important that people get this, I’ve seen a video of you talking about lymphatic drainage in the brain. 2005, I believe. Dr. Raymond Perrin Ph.D.: Yeah. Ari Whitten: 12 years ago and it sounds like you’ve been talking about it even longer than that, maybe close to 20 years or more than 20 years. Ari Whitten: Now I will point out for people listening, as of 2017, just this year, I think about six months ago, something like that? Dr. Raymond Perrin Ph.D.: Yeah. Well, it’s actually a paper you talk about, came out in October. Dr. Raymond Perrin Ph.D.: NIH paper, yeah? Ari Whitten: Yes, and this was a huge, I mean amazing piece of research that came out in the United States. It was published all over in major media outlets. I would imagine all over the world, really in mainstream news. And it’s rare that a scientific discovery kind of makes it all the way to mainstream headlines. What was this big discovery that just happened in 2017? It’s that the brain has lymphatic vessels and has lymphatic drainage, which again, this is being hailed in 2017 as this amazing new discovery. You’ve been talking about this for over 20 years. Dr. Raymond Perrin Ph.D.: Yeah. And I’ve been treating it for over 20 years. One of the things they said in the article, the NIH, was this could lead to understanding the newer immune disorders and so many neurological disorders. Well, we now know it actually exists. And they were saying, “But we don’t know how many diseases it affects and we also don’t know how to treat it.” Well, I’ve been treating it for 20, well, 28 years. My paper on this drainage of the brain being, which we’ll come to soon, was published in an American journal, the journal of the Osteopathic Association of America, in 2007. Dr. Raymond Perrin Ph.D.: Affecting the [inaudible] So we’ve known about this but we’ve never had absolute proof and that’s the trouble. I’ve been treating this but there’s not been any evidence to show this because it’s very, very hard to scan this area. But what we believed, in the brain there are passages. There are gaps next to blood vessels and these are called perivascular spaces, also called Virchow-Robin spaces. Now these perivascular spaces, it’s theorized by other neuroscientists over the years. There’s been Southampton University where they’ve done a lot of work there. And there’s also been work in the States by different scientists and Russia, looking at this drainage system. But there’s always been a theory. They realized that there must be a drainage, but nobody’s actually been able to show where it is and exactly how it works. So then the big breakthrough came. Roy Weller was the professor at Southampton and he published a paper showing that if you inject it into the brain of rats, that what you injected in brain ended up in the lymph nodes of the neck. So there was a connection but we couldn’t prove that it was just through those spaces. And then in 2012 at Rochester University, Jeff Iliff and his colleagues in Rochester, New York showed that the drainage did exist in mice. Proved it and he showed that this space actually filled up the perivascular space. And the most interesting thing is, when it stopped working, they produced genetically modified mice that actually didn’t have this drainage system. It was a buildup of the fluid around the hypothalamus, around the thalamus and around the basal ganglia which explains so much of the symptoms of ME. Basal ganglia, for those who don’t know the newer science behind it, the basal ganglia have lots of different functions. One of the main functions of basal ganglia is pain suppression. They produce a chemical called GABA. And GABA being a butanoic acid actually suppresses pain. So that gets affected. This causes more centralized pain. And that’s what people with fibromyalgia and chronic fatigue syndrome have: pain. And then you’ve also got the basal ganglia, also are part of the limbic system and I know you’ve Ashok Gupta on talking about his amygdala. An amygdala’s part of the basal ganglia. Dr. Raymond Perrin Ph.D.: So if the drainage doesn’t work, it’s going to affect the amygdala function. I mean, Ashok deals very much with the limbic system but it’s much more than that. Once the toxins stop draining, it will affect the whole brain. But these are the areas that they’ve found first of all. And there’s also the limbic system is the emotional side which affects the thalamus and the hypothalamus and the basal ganglia. They’re all going to be affected big time. And also sleep is going to be affected. And so the sleep center’s there and one of the main things is that the basal ganglia are like the junction box which we know the frontal areas of the brain, the thinking part and all the doing part of the back of the brain. Tracks go through those from one area to the other. And this means that if you get this affected because toxic buildup in this area will end up with everything becoming more of an effort. Everything. Walking, talking, reading. Everything becomes laborious and this is what chronic fatigue syndrome patients feel. Everything becomes more of a chore. That explains that part. Then in 2013, I got in touch with Jeff straightaway and they said they’re looking at beta amyloids which was being implicated in Alzheimer’s ’cause that’s one of the things that was looking at, as Alzheimer’s caused by the same problem and many of us believe it is. It’s interesting, the early symptoms of Alzheimer’s are very similar to the symptoms of chronic fatigue syndrome [inaudible 00] The thing is that there’s that going on and then also … So they started looking at what happens to these mice when they sleep. That was amazing because, in my original hypothesis, I drew a picture. It’s in my book. It’s in my thesis and this picture shows the hypothalamus and a little organ in the brain stem called the locus coeruleus. Now the locus coeruleus produces a chemical called noradrenaline. And it produces a blue hue on the brain. If you actually do a dissection of the brain, this area is actually slightly bluish because of noradrenaline, over in America, they call it norepinephrine, is slightly bluish. And this noradrenaline or norepinephrine, I’ll use American term for you, and this is like epinephrine. It’s like adrenaline, it causes you to be wired and fired. And I said many years ago, I drew in 2013, 2014 … Sorry, 2004 I drew this diagram that then was in my thesis and this diagram showed that the drainage of the brain, I showed two organs. The hypothalamus and locus coeruleus. And what Iliff and his team in Rochester discovered and there’s a paper by, I think it’s under the principal author was Xie et al 2013, it’s the same group in Rochester. And they showed that this drainage system occurs mostly during delta wave sleep. In delta wave sleep the hypothalamus and locus coeruleus axis switched off. And this went around the world as well. We now know why we sleep, because the brain needs to drain toxins out of the brain and spinal cord and it does it during this delta wave sleep. [inaudible] that many patients don’t get. Dr. Raymond Perrin Ph.D.: Very very little delta wave sleep. They have alpha wave and the alpha wave doesn’t make you feel wired and fired because hypothalamus locus coeruleus axis switches on and don’t get deep restorative sleep. You feel wired and fired. And most patients with chronic fatigue ME, because their hypothalamus locus coeruleus axis doesn’t switch off, it’s firing off all the time and it’s not draining the toxins away. They’re wired and fired at night. They can’t get to sleep. Dr. Raymond Perrin Ph.D.: Well it’s the poisons building up in the hypothalamus and that’s due to the fact ’cause then we’ll come a bit further. Sorry, I’ve missed out one salient point and this comes to the whole vicious circle that causes ME. So this has now been shown to actually be the case that this is what the hypothalamus locus coeruleus axis did but the hypothalamus and the brain stem is very involved in this sympathetic nervous system control or the autonomics. And the main part of the autonomic, a major part is the sympathetic nerves that come out from the spine in the upper thoracic spine and fire off to all over the body. Ari Whitten: Yeah, I didn’t learn it. I learned that lymph drainage is purely a function of muscle movement and the diaphragm and so on. Dr. Raymond Perrin Ph.D.: So this is, now we know 100% there’s this pumping mechanism. The work of John Kinmonth who’s a surgeon in London, he wrote books on this. And he could never prove this pumping mechanism existed but what happened is he said that in disease states the pumping mechanism, because sympathetic nerves go wrong, it causes a backflow and this is so salient to my whole theory and it involves why we can see certain signs of ME. It causes a backflow of lymphatics. So instead of pumping out, they’ve got valves that allow one-directional flow, it pumps the wrong way. So what you have is a beaded vessel that Kinmonth called the varicose lymphatics and the vessels become very enlarged and they become varicose megalymphatics and he tried to prove their existence but every time he did a scan, all his colleagues said, “Very nice scan, John, but it’s just a varicose vein” ’cause it was just white on a black background. Dr. Raymond Perrin Ph.D.: And then in my book and my thesis and I think in my lecture, she showed a photo of the varicose lymphatics where you could see … Well this one patient came in and you actually see it on the surface of his chest that the thoracic duct goes to the left subclavian vein and this was pushing back and you have drainage in the right side as well and the backflow caused actually you could see it on the surface of the skin and this showed varicose vessels that were showing a backflow of lymph but there was no color. There were no blood ’cause varicose veins would be bluish or purplish. Dr. Raymond Perrin Ph.D.: These were colorless ’cause lymph has a colorless fluid in it. The lymphatic fluid is colorless. So these were the first photos when it published in my journal paper. It’s also in my book, the first photos ever of varicose lymph. Ari Whitten: Yeah, I saw them. Dr. Raymond Perrin Ph.D.: We can’t see these in most ME patients and chronic fatigue syndrome patients or fibromyalgia patients but we can feel everybody with just one of the physical signs that we’ve just researched and you can actually feel the varicose lymph just under the surface especially in the chest ’cause that’s the first [inaudible] where there’s a backflow. This is a second reason why women get ME much more than men because their breast tissue is much more engorged than men because they’ve got much more enhanced breast tissue. Dr. Raymond Perrin Ph.D.: It’s a lot to take in but basically, in a nutshell, there’s a backflow. This backflow of lymph goes back into the brain. So this drainage system that we now know exists like you said, we’ve now got proof of it from the papers in 2013. 2015, they showed more studies showing that there was actually lymph drainage in the meninges in the membranes of the brain, actually showed proper lymph vessels and that was the work done in Virginia University by Johnny Kitnes and his team and also shown by Aspen Lund in Finland I believe. And then, that was 2015 and now, 2000 … That was all animal studies. So all my people who want to sort of criticize my work can say, “Well, it’s in animals, not in humans.” Now we have an NIH study that involved the team from Virginia and Rochester. I believe they showed the drainage in humans. [inaudible] and it actually is there. Ari Whitten: Beautiful description. So since this is there are so many moving pieces that you just outlined, I would love if we could recap all of these different steps of this vicious circle in a kind of summarized simple way for people to really get this concept. Dr. Raymond Perrin Ph.D.: Right. So very simply, I have … It’s in my book but the diagrams, but very simply, the brain and the spine should drain toxins away ’cause this drainage is just not … The scans have shown all the proof and all the evidence have shown that the brain drains is also in the spine. That’s not been looked at yet. Hopefully, somebody will look at this and say yeah, that’s just some MR scanning on the spine as well and see this. The spine and the brain can be affected genetically. It can follow from parental, it can be familial but it could be from trauma to the head or trauma to the spine or doing too much. Most chronic fatigue syndrome patients do too much. When they’re younger and their spine develops wrongly, the very active youths are very younger and this spinal problem that we see, this has been again shown to be correct. I hypothesized this in ’93 and it’s now been proven by work done by Johns Hopkins University, Professor Peter Rowe is a very eminent specialist in chronic fatigue syndrome there and he’s done the work that shows that the spine, the thoracic spine is affected. So once you’ve got a problem in the spine and you’ve got a problem in the head from maybe a trauma or maybe the way you developed the way … This drainage. And the drainage, this is very important, Ari. The drainage is in this area mainly in this area called the cribriform plate which is behind where my fingers are pointing now. It’s also drainage behind the eyes, the trigeminal nerves in the cheeks and the ears, they’re the main drainage of the cranium and they’re the main areas that get congested or there’s a backflow in this area and you’ll find most ME patients and chronic fatigue syndrome ME, fibromyalgia get a lot of pain behind the eyes, behind this area, in the ears. They have problems. They have photophobia, the eyes are very sensitive to light. Their ears are very sensitive to sound. All this is because of toxins building up. Once the toxins build up, they then start the vicious circle going. The hypothalamus then sends wrong messages to the sympathetic nervous system around the body which then causes the main duct of the lymph to pump in the wrong direction. And when it pumps in the wrong direction, more toxins are getting built up in these drainage points. In the spine and in the brain, so you get more and more inflammatory toxins and from infections or from stress or from injury or from pollution. Pollution is a massive amount of toxicity. There are 80,000 known toxins in the environment and there’s a lot of environmental doctors including Sarah Myhill, she was originally an environmental doctor who’s seen that there are lots of pollutants affecting the body. And then there’s also familial, it can be genetic as well. And then you have this buildup of toxins and then this whole system spirals out of control. The sympathetic nervous system goes wrong. The main ducts of the lymph go worse which causes more and more toxic buildup eventually leading to ME. Dr. Raymond Perrin Ph.D.: I hope that makes some sense to you. Dr. Raymond Perrin Ph.D.: Regulation of the whole metabolism. Dr. Raymond Perrin Ph.D.: That where you see so many metabolic problems in chronic fatigue syndrome and the one cruel part, and this is one last thing I’ll say. Chronic fatigue syndrome ME, fibromyalgia aren’t the worst illnesses in the world but they’re the cruelest ’cause they usually hit people who are very very … Who have got a lot of willpower to get better. Willpower can help people even with cancer have been shown and how that work is ’cause the sympathetic nervous system in these patients stimulates the immune system to work better. But if it’s that system going wrong, the more you try and say I’m going to beat this, the worse it gets. Dr. Raymond Perrin Ph.D.: This is how cruel it is ’cause the more a person tries to get better, the worse they usually get and they have to back off and not … No one wants to accept the disease but they mustn’t try and fight it. Got to try and work out how to combat it in a very gradual way and that’s what we do. Ari Whitten: Got you. So there’s a number of things I want to digress into a few comments and a couple questions. I think there are some interesting connections. One is in the modern world we have this trend where it’s less and less sleep. There’s a progressive change over the last 50 years or so where people are getting an hour or two less sleep than we did just a few generations ago. We also have a chronically disrupted circadian rhythm as a result of not enough time outdoors, too much artificial light at night in conjunction with that. Now that we know that one of the critical roles of this lymph system function, especially at night while we sleep, is to cleanse toxins from the brain, I think there’s a clear link there as well as to how disrupting circadian rhythm and sleep deprivation tie into this vicious circle. Dr. Raymond Perrin Ph.D.: And that’s the thing is, you’ve got to have that axis in the brain working to allow this drainage to occur. And that means delta wave and Stanford University have shown, there’s a wonderful couple Marcy and Mark Zinn at Stanford have done a lot of work in this field and they’ve shown that most ME patients get delta wave during the day. Ari Whitten: Interesting. Does one side matter over the other? Dr. Raymond Perrin Ph.D.: I don’t think one side matters. He’ll say lie on your left side ’cause it’s meant to be healthier but lying on your side is good for your spine. The myths have not gone further with … There’s a whole drainage of perivascular spaces down the spine as well. And that’s why lying on your side probably helps ’cause it helps the spine drain off the toxins as well. It’s not so much the brain that is draining more, it’s the spine that’s draining more. So we tell all our patients to lie on your side, a cushion between your knees and that’s good for the spine and that helps the drainage as well. Simple that that. That’s one of the very important things about sleeping. But you’re right, the whole rhythm can change and that’s why shift workers get a lot of illnesses because of their circadian rhythms and it’s very important to get that rhythm right again. Dr. Raymond Perrin Ph.D.: Blue light filters are so important all through the day and then at night, no screens at all. So nobody with chronic fatigue syndrome should be watching this last thing they get before they go to bed ’cause it’s bad for all they should have, so no screens at all and if you use screens, use a blue light filter. You can get glasses, the orange and yellow glasses that you can wear, they’re better than the screen filters but you need some filter ’cause blue light stimulates alpha waves and we don’t want alpha waves at night. Dr. Raymond Perrin Ph.D.: And then there’s also good sleep hygiene in getting, first of all, a good comfortable bed and making sure there’s nothing interrupting you. Make sure you have a real darkened room and all these things help. Ari Whitten: Absolutely. Yeah, I actually go through a whole system of about a dozen circadian rhythm habits and then 17 different sleep hygiene habits and I see so many people that improve dramatically, literally within 10 days, 14 days of just applying that. Now that, beyond just the circadian rhythm regulation of hormones and metabolic functions, it now makes more sense to me why so many people kind of improve dramatically from that just based on allowing toxins to cleanse from the brain a little more efficiently. Dr. Raymond Perrin Ph.D.: Yeah, yeah. Ari Whitten: So another area, I guess a quick question on this subject of enhancing lymph drainage, one of the things people talk about is jumping on a trampoline or even doing vibrational therapies. I’m curious if you think those have any value. Dr. Raymond Perrin Ph.D.: When I first realized the lymph was involved, it was interesting how I got involved in this because I had a patient who had lymph engorgements in the breast tissue as we see now all the time, and when we actually did work on the lymphatics and direct work on draining off the toxins, the treatment we do is, I call it the “Concertina Effect”. You push down and you push up back and front, and you drain off all the pressure goes into this area which then forces the drainage to occur into the bloodstream. When we did that, she had palpitations, she had problems in breathing, which is very common in very severe ME patients and these all went very quickly. What we realized with the drain … I’ve forgotten the question now. Dr. Raymond Perrin Ph.D.: Yeah, what I realized then is that when I first started involving lymphatics, it’s not some different techniques for lymphatic drainage, trampolining and doing the vibration and all of those and there are techniques that I taught. Thoracic pump techniques, abdominal pump techniques. There’s standard, there are vaunted techniques, there’s a lot of different standard techniques for lymph drainage that I tried on patients and was failing. Patients were getting worse and worse and worse and I couldn’t understand what it was. Then I realized with the discovery of these varicose lymph and discovered there’s this backflow when you stimulate the lymph to work more in the wrong direction, you’re making the symptoms worse. So the standard lymph drainage techniques that help sluggish lymph will make an ME patient worse. Dr. Raymond Perrin Ph.D.: So they mustn’t do that. When they’re on the mend, we’ve got this reversal sorted out and everything’s pumping the right way ’cause that’s how it works. When we’ve got the drainage working and the cranial, this is where it comes into the cranial rhythm which we can talk about maybe now or should I talk about cranial rhythm now? Dr. Raymond Perrin Ph.D.: Right. In the paper, I published in the Journal of the American Osteopathic Association, 2007, was on the cranial rhythm. Now the cranial rhythm impulse is a rhythm that is very much an osteopathic term. But a lot of manual therapists do cranial courses or cranial sacral courses, up ledger courses, [inaudible] courses and these are about the drainage and stimulating the cranial rhythm but what is the cranial rhythm? And the cranial rhythm is so important part of my whole treatment and for years and years, I was using cranial techniques without really, really knowing what I was doing. I knew I was stimulating some rhythm but I didn’t know what that rhythm was. It was around eight to 12 beats a minute but what was causing it. With my research, I discovered that this was fundamental in the whole of osteopathic philosophy. In the brain, cerebrospinal fluid is produced by the blood. It’s produced by an area called the choroid plexus cyst. Produced by the blood, it goes around the brain and goes out the blood again. It starts at 50 to 100 beats a minute. It then goes around the brain and comes as 50 to 100 beats a minute, the cardiac rhythm. So in the brain itself, we know that it’s 50 to 100 beats a minute. When we do MRI scanning and I’ve done quite a lot in the search, when we look at the cerebrospinal fluid in the brain, it moves at a rate of 50 to 100 beats a minute. But some of it now drains off through these passages and this goes into the thoracic duct. Due to the wonderful work of John Kinmonth I mentioned earlier, beats at a slow rhythm of around 4 beats a minute. When having two waves coming together, physics dictates a phenomenon called interference. You have an interference wave and you don’t need to be a physicist for this. You just have to be at a beach and you see a big wave coming in, small wave going out. They crash together, produce a third wave. In the body, the third wave is produced by the cranial flow from the brain which starts at 50 to 100 beats a minute into the lymphatics, producing a third wave. And that third wave, osteopaths call the cranial rhythmic impulse. And that is dysfunctional in all ME patients and it’s because it’s just not draining properly. There’s a disturbance in the flow and this disturbance in the flow causes the rhythm to change and we can feel this and this is one of the physical signs of ME. So this whole drainage system is working the wrong way and if you just stimulate the lymph to work better it will work more in the wrong way. But we need to get it working the right way first and once you drain the toxins off using cranial techniques, once you’ve got the lymph drainage techniques working, the spine working better, all the drainage will occur hopefully, naturally and healthily. All the toxins will drain away from the brain and bit by bit, the brain will start functioning again and the symptoms will ease off and that’s how it works. So if you do the standard lymph drainage techniques, pumping and vibration, you can stimulate this draining to work more in the wrong direction, causing more toxicity. So you have to get the draining working right and that gives an idea of what the actual reason for the whole treatment and why it’s done the way we do it. Ari Whitten: Got you. So one question. The initial story of your discovery, you talked about this cyclist that you worked with and you addressing the postural issues. Ari Whitten: And how he was fixed in a relatively short period of time. Now, it seems as I’m listening to you talk, it seems like you’re emphasizing more the lymph drainage techniques and less of the spinal deformities and addressing the postural aspects of things. 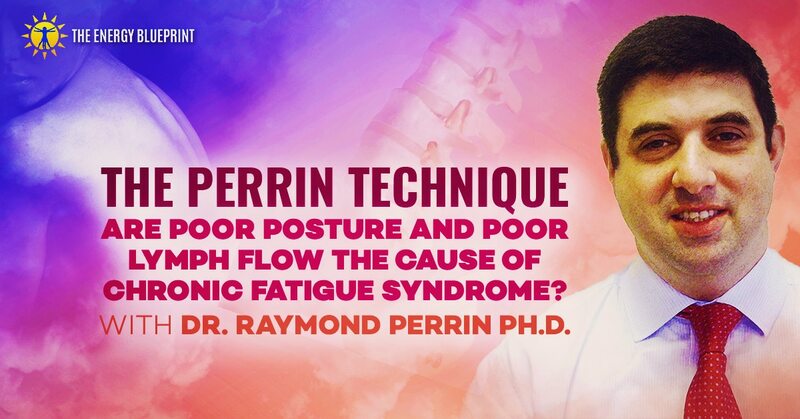 Dr. Raymond Perrin Ph.D.: Yes, the postural aspects are important because they help the drainage and as Peter Rowe has discovered in Johns Hopkins University, there’s a lot of spinal problems in ME in the thoracic area. He’s found the same problems that I have. There’s usually a flattened area in the mid part and there’s what we call lordosis in the mid part of the thoracic duct and sometimes kyphosis above and below. This is very very common and it can be seen in most ME patients, you see this pattern. But it’s always a disturbance of this area. So there’s a lot of problems that we can actually physically see with ME and these are the signs. We just finished a research project that has been published just now in November 2017 in the British Medical Journal Open Access, so it’s BMJ Open so everybody can read it which is nice. Ari Whitten: Yeah, I looked at it and we’ll put a link in the show notes for this page to make sure people will get it. Dr. Raymond Perrin Ph.D.: Yeah, so there’s the five physical signs that we see in all ME patients. Now we’ve done the study, it shows a link to this physical, all I’m saying that there are actual physical signs and the BMJ said this offers a truth of concept for these signs because we showed 86% of patients were correctly diagnosed just using physical signs. Dr. Raymond Perrin Ph.D.: No symptoms, no history. Dr. Raymond Perrin Ph.D.: Just with physical signs. Now in the clinic, we go through history. We go through symptoms and we have these physical signs to show and these physical signs don’t just help us diagnose almost 100%, they also are very important in severity. So the more severe the physical signs, usually the worse the illness is and sometimes I can see patients are trying to be healthier than they are and their body’s telling me it’s not. So the physical signs are real and they’re in my book, but basically there are tender points in the chest and the abdomen and there are spinal problems and the cranial flow problem and these varicose lymphatics are all signs of neuro-lymphatic damage to the brain and the autonomic nervous system and the lymphatics not working the way they should do. [inaudible] this is all of my thesis. Ari Whitten: Excellent. So what about the spinal deformity aspect of it? Do you see spinal deformities reliably and hyperkyphosis in the thoracic spine? Dr. Raymond Perrin Ph.D.: But it was showing what I noticed with patients and all ME patients. I’ve never seen an ME patient yet that doesn’t have a thoracic spine problem. Ari Whitten: Interesting. The reason I bring that up is my brother’s actually a chiropractor and specifically a posture specialist. He doesn’t specialize in chronic fatigue syndrome or fibromyalgia specifically, but he’s had a number, maybe close to ten patients over the last decade who have had either fibromyalgia or chronic fatigue syndrome and he’s been able to achieve remarkable improvements of symptoms just by treating posture. Dr. Raymond Perrin Ph.D.: Yeah. And you can. But the lymphatics … What we’ve tried to do all the time, I’m trying to get more and more severe patients better and the very severe patients, there’s very little that can be done for them, but if they can be touched … If you can’t touch a patient, there’s nothing … I can’t help them. So with fibromyalgia and ME, you can treat the posture and improve it. You can treat lots of things and improve it and there’s diet, there’s nutrition, there’s looking at the mitochondria as [inaudible] does. All these things are going to help the jigsaw but you’ve got to get the neuro-lymphatic system working better to get to the root of what I believe is causing the problem and that patient is going to recover fully, not just improve but fully. And it’s not easy and I don’t have … There are always people out there who may have had my treatment and it’s not helped but we can’t help everybody. We try. Ari Whitten: And that, by the way, explain post-exertional fatigue. Dr. Raymond Perrin Ph.D.: Exactly. Exactly, and it’s all related to autonomic dysfunction that’s now been proven by the work by Newcastle University in the UK and Ashok Gupta, his work, his personal experiences of the limbic system ’cause he came through it through having the illness himself and Ashok’s work is very interesting because it does help if you reduce … One of the biggest causes of neurotoxins is stress. So any treatment at all that reduces stress is going to help. It’s not going to cure. It helps. If the main reason for the toxicity is stress, then it might get the person to normal life and living, fine. But it’s just one of the parts. It’s not just stress, there’s physical damage sometimes in patients. And some patients, there’s not too much emotional stress, it’s more viral stress, bacterial stress, environmental stress and those are things that need to be related. What Sarah Myhill does is treat the result of this stress. Now I know she believes it’s all in the mitochondria. But if the mitochondria go wrong and it’s a mitochondrial disease and it causes all the rest of the things to happen. But really, I believe what she’s doing is treating when the metabolic system and Robert Naviaux as well with the metabolic test that he’s done. When the autonomic nervous system, the control mechanism that balances the whole metabolic rates goes wrong, then every single blood test you have will start showing different things going wrong. And the more and more they look, the more and more they’ll find wrong. It’s not going to be the answer. Dr. Raymond Perrin Ph.D.: That was a San Diego study, but there’s been another study at Stanford that showed different metabolic … And it’s interesting, the cytokine profile has been done a lot … When they discovered it, there was I think seven and there’s twelve now. There’s 17, I think, cytokines and that’s going to be more and more as they find. It’s actually very interesting. One of the cytokines that they found is leptin which is a female hormone that affects satiety, hunger and loss of appetite and appetite, increased weight and decreased weight. Leptin is very involved in that and Professor Jared Younger discovered that the levels of leptin went up as the symptoms went worse with chronic fatigue syndrome, ME and then went down and it’s very related. This is one of the cytokines that are very much related. And it affects the glial cells of the brain, these glial cells, the astrocytes and the glial cells of the brain and this is where these toxins stay and it’s the drainage of the brain that the Americans call “the glymphatic system” draining the glial cells. So the toxins build up there and this is all that’s happening with the central drainage problem that leads to all these other metabolic problems and pathways. And this is what’s happening. So there are ways of treating the results of that. But what I’ve tried to do over years and I’ve been working on this, almost three decades I’ve been working this field, is to look at what’s the root. And the root is not going to be treated by a drug. And that’s the problem. Dr. Raymond Perrin Ph.D.: That could be the case in some cases but what starts it … See, the question is, and this is the one question I asked years ago. When it used to be called post-viral fatigue, it’s not the virus, it’s the post-virus. It’s the buildup of these cytokines or prostaglandins or other inflammatory toxins after the virus has hit that needs to be drained away. These are large molecules. It’s large molecules. It’s always the large molecules. In nutrition, you look at nutrition. What affects ME, patients? What causes their gut dysbiosis and the leaky gut and everything? It’s the large molecules. The protein molecules like casein in milk. Gluten. Candida. Yeast. All these are major toxins for … ’cause there’s a massive amount of lymphatics in the abdomen and they’re not draining these … These large molecules are not drained away. They’re leaking through in the gut and it’s very interesting. The histology of the gut is very similar to the histology of the brain. So the blood-brain barrier has a very much link to the blood-gut barrier and this drainage occurs badly in this area as well and it needs the lymphatics to drain it away. So this is another clue to the fact that it’s a lymphatic system problem that is very much at the heart of the whole problem. If you can drain these toxins away, you can help all these other symptoms that ME patients associate. And once the systems, I’ve got patients who’ve just had my treatment, nothing else, and have gone from very sick to completely better without any mitochondrial support, without any torquing therapy at all. And is because they’ve been lucky enough to drain off all the toxins and everything starts working again. Most patients aren’t that lucky, they need other things as well. Ari Whitten: Right. I mean, it’s interesting because you can find lots of case reports and even some actual research on specific individual methods that have been completely cured of … For individuals with chronic fatigue syndrome. There’s research, for example, showing that just focusing on the gut as the cause of CFS and doing a gut healing protocol can completely cure it. There are people focused specifically on the mitochondria who can completely cure it in a portion of people with that. If anybody’s through a Ph.D. process, when you actually go, you have a few hours of examination by two examiners and they drill you on everything about your Ph.D. and I still remember one of the questions. It said, “can patients get better without any treatment at all?” And I’ve seen cases that patients reported get better without any treatment. Those are the cases where they’re looked after, they’re in a good environment where there’s no stress, there’s no strain, they’ve got a good diet and bit by bit, the hypothalamus starts working again. Dr. Raymond Perrin Ph.D.: Bit by bit the sympathetic nervous system starts working and if they’re lucky enough to have that situation, eventually everything will start working naturally and they’ll get better without any treatment at all. Dr. Raymond Perrin Ph.D.: They’re going to look into that. One thing I’m going to say at this meeting, I’m going to say exactly what you’ve just said here. If all of us who are helping patients with ME got together, and we just had a … Forget about one bullet cure. Dr. Raymond Perrin Ph.D.: Forget about that. We spend so much money. There was so much hope on the rituximab just recently. The study’s done, and I spoke to, in the last ISCFS meeting, I spoke to [inaudible] who developed this … you know about rituximab? This is a drug that they thought was the cure for ME. It helped some cancer patients and some people with serious autoimmune diseases. It helped them with their chronic fatigue and there was a subset probably of people that it basically wipes out the B cells, which are half your immune cells and it starts over again and that’s in a nutshell. So we didn’t know whether rituximab was a cure. They weren’t telling people that it was a cure. They didn’t know which group it actually helped. They knew it helped some patients and this is the same thing with all these drugs you see. There’s going to be some patients who respond to some drug but there’s not one drug that helps all patients. You’ve got to think seriously about the side effects of the drugs and if the side effects can be really severe, then you’ll have patients getting worse by taking these drugs. And this is very … I’m not against drugs. Drugs are very important in certain symptoms and they’ve found certain drugs help with ME and certain supplements, lots of supplements help ME but some patients don’t respond well to even supplementation. You’ve got to be careful about supplements. So I do appreciate what Sarah Myhill talks about. And I do appreciate that and I have seen patients improve with her treatments but sometimes it’s a combination of my treatment and her treatment that helps the best for these patients. Ari Whitten: Yeah, well I’m glad you said what you said that we need to stop looking for this one magic bullet. I think there’s a lot of people out there that are very ego driven about kind of their thing needing to be the one thing that cures everybody. Dr. Raymond Perrin Ph.D.: I’ve heard that for years. It’s not going to happen. Dr. Raymond Perrin Ph.D.: There’s never going to be one treatment but I believe my treatment is a very essential part for most of the ME patients that we see. Ari Whitten: Yeah, and I believe that and there’s an interesting report that I read. I think it was from Cort Johnson of Health Rising where he kind of did a review of kind of survey data from all these different, I think it was 2,200 people with chronic fatigue syndrome, of all these different treatments, that they tried everything from graded exercise therapy and CBT, kind of that standard treatment, to the Perrin technique to just massage and physical therapy to chiropractic and all sorts of other techniques and what you see with all of that is that each technique seems to cure a portion of people and then make a portion of people worse and then not affect a portion of people and there are different proportions in each category for each method. Your treatment fared very well relative to a lot of the others but I think again I think it’s interesting that … I mean I think that data tells me that it’s not going to be one thing that fixes everyone. Dr. Raymond Perrin Ph.D.: It’s not any one thing and it’s different practitioners that do different things as well. This is the trouble when you’ve got a tailor-made treatment that I’ve developed, it’s a lot to do with the skill of the practitioner as well. Dr. Raymond Perrin Ph.D.: You’ve got to have a skillful practitioner who’s been trained properly to do it. Otherwise, it could make people much worse and the book gives an idea behind it. But basically, some people can use some of the ideas in the book to help themselves but it is difficult. I’ve spent my life now going around the world, training up practitioners and hopefully within time, there’ll be other practitioners to learn how to train up other so we can deal with all of the millions of sufferers around the world. Dr. Raymond Perrin Ph.D.: But it’s not just my treatment. I’ve never said that. All I tell my patients is, 90% of our patients we help. Dr. Raymond Perrin Ph.D.: And some we don’t any of those patients, we help, we reckon, we did an audit that showed 15% get completely better with just our treatment. Dr. Raymond Perrin Ph.D.: That is what I say. Ari Whitten: Yeah, well I’m glad you explained that for most people, it’s going to need a multi-pronged approach to fix this. I think your work is key in that. With that in mind, for people listening, how can they start doing the Perrin technique. I mean, there’s a lot of listeners who are in the United States. A lot of people in Australia and Canada and various places other than the UK. Dr. Raymond Perrin Ph.D.: Well, I’ve trained practitioners in New York. There’s ten of them in New York. There’s one in California. There’s a couple in New England. But the rest of America, I suppose it’s difficult. It doesn’t work well because it’s a long treatment and it doesn’t always work well with the insurance companies in America. Ari Whitten: And you have to come in fairly regularly? Ari Whitten: Yeah, my hope is that with your recent research that was published in the British Medical Journal and all the media exposure from that, I hope that your work, which I think is really pioneering and is amazing stuff, I hope it will become more widespread and hopefully in the next few years, you’ll have an army of Perrin technique certified practitioners all over the United States and every country around the world. Dr. Raymond Perrin Ph.D.: Like [inaudible] disease. MS. Possibly motor urine diseases. All these diseases, maybe that using part of the treatment, using my techniques could help a lot of these. We are doing a bit of work in our clinic on patients other than just the chronic fatigue and having some very interesting results but I’m not going to talk about that because we haven’t done the research yet and without research and without studies we can’t say too much. Ari Whitten: Yeah, well I’ll express my opinions personally. I think with the logic and physiological mechanisms behind everything you’re talking about, I mean it only makes sense that your work and your methods would benefit pretty much every neurodegenerative disease. Dr. Raymond Perrin Ph.D.: Well I think that if they read the work … Most people say when they’ve read my book and we’re working on book two with all the science now to back up what I’ve said in book one and it’s taking time ’cause it’s a lot of science to back it up now. Dr. Raymond Perrin Ph.D.: But we’re working on book two and that will come out sometime next year, hopefully. But book one’s available in all the main outlets and most patients when they’ve actually heard my work, maybe when they’ve just heard this interview now, will say it makes sense. They’ll say it makes sense. Dr. Raymond Perrin Ph.D.: Science is nothing but organized common sense. That’s a famous quote. Ari Whitten: Yeah. That was my reaction when I read your work and I also want to just rehash how impressive I think it is that you predicted this amazing 2017 discovery that was this barnburner discovery of this amazing thing and here you are not only knowing about it for over 20 years but actually practically using that knowledge to actually help people. So I think your work is pioneering and it’s really been an honor to have on the show. Thank you so much. Dr. Raymond Perrin Ph.D.: Thank you very much, Ari. It’s been an honor to be on and good luck with all your work as well. Ari Whitten: Yeah. Thank you so much and good luck to you and we’re going to put a link to your research and a link to your book and thank you so much. It’s really been a pleasure and I hope to do this again. Dr. Raymond Perrin Ph.D.: As they say in the States, happy holidays. Ari Whitten: You too. Take care. Dr. Raymond Perrin Ph.D.: Bye-bye for now. Being stressed is causing a lot of strain on your body, especially in your brain. 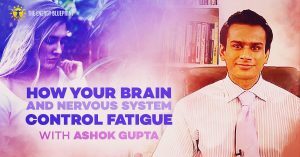 Learn more about how our brain is causing fatigue. Thank you so much, Ari, for sharing this information and for the generous work you do. Dr. Perrin’s approach makes good sense to me. Been struggling with ME/CFS for nearly 2 decades. I’m not a ‘science person’ but I do know that ME/CFS is a complicated beast that drains ones resources in every way. I’m grateful to have this infusion of hope, and to be reminded that there are smart and dedicated science people out there looking to tame this beast. Thanks for this one Ari! Much food for thought there. Meanwhile,I’m pondering Dr.Perrin’s theory/observation about person’s with CFS/ME ”all” presenting with ”flattened” thoracic backs.That likely applies to cyclists and other athletes or to Type A personalities.And,more than a few of those folks burn-out or push it to exhaustion.Think ”marathons”.Or, it might apply to professional women who are constantly in high heels.Normal spinal curvature displays some lordosis in both the lumbar and cervical regions with an acceptable kyphosis in the thoracic region.If this is exaggerated as in ”swayback” or in extreme cervical lordosis that’s problematical.Otherwise,many persons with CFS/ME(including myself) have no thoracic flattening,or,in fact,are even more kyphotic in curvature(”rounded”) in the thoracic back.It’s easy to visualize: …Someone that is more sympathetically triggered,active and aroused( ”Green Light Reflex”)…tends toward flat-back….while someone who is exhausted or often lethargic/depressed( ”Red Light Reflex”) is more ”hunched-over”. Many with CFS will fit the latter….especially as the years roll-on and the illness progresses. Meanwhile,Dr.Perrin’s focus on the Hypothalamus,the Cribiform Plate,and the Locus Coeruleus are invaluable. The Rasayana aspect of the Ayurvedic tradition recognized this 1,000’s of years ago and also focused upon cranial ”Marma Points” and the thick lymphatic zone which we now know is associated with the Sagittal Sinus. Once we put all of this together we will treat even more with CFS,early Alzheimer’s,neurological conditions and more! Post holiday the Perrin interview continues to intrigue…especially around Dr.Perrin’s comment on the hypothalamus and the BBB(…Blood Brain Barrier).This may be a bit ”science-heavy” for some of your listeners but I feel it’s important.Perrin stated that…THE HYPOTHAMAUS IS ONE OF THE FEW SITES IN THE BRAIN ALLOWING ”LARGE;; MOLECULES FROM THE BLOOD TO ENTER and that the BBB ACTS AS A FILTER ELSEWHERE. He then went on to use ”Insulin” as example of a large molecule(..5,808 Daltons) compaired to Water(..18 Daltons) and described the important role of the hypothalamus in sampling and balancing hormones.Very true. Still,the thing is that medicine had been struggling for years to treat Alzheimer’s,etc. via all manner of drugs and in many molecular sizes.Which is why research believes that ”Intranasal Delivery” now holds the most promise for delivering therapeutic substances to the CNS.Intranasal delivery,of course,intimately relates to access to the hypothalamus and more.Now,notice that Perrin refers to allowing large molecules from the ”Blood” to enter.The medical research and trials,however,are referring to this: …To using intranasal delivery so that substances can enter the CSF(…Cerebrospinal Fluid) and from there…the ”nasal lymphatics”. And,to do that size and molecular weight of substances is a factor. S.Talegaonkar states that 1,000 Daltons appears to be the cut-off point and that molecules less than that are better absorbed. Talegaonkar also says they have had good success delivering the hormones Estrogen and Progesterone via intranasal delivery. So,it appears we have some good science here and some that needs further clarification and development.Meanwhile,I also find it fascinating that the ancient Ayurvedic application of ”Nasya” treatment just also happens to be a form of intranasal delivery.And to emphasize this even further…most of the good research on modern possibilities for intranasal delivery are coming from Indian researchers.Go figure. Are there other treatment modalities that accomplish the same thing as the Perrin Technique? I’m not in an area of the USA where there are any practitioners. Thank you.